The use of silvopasture systems on farms in the Northeastern United States has never been documented. Our objective was to gather baseline data to describe silvopasture practices and perspectives in the Northeastern United States. To accomplish this, we investigated the structure, management of, and reasons for use of silvopastures in New York state and New England through a series of interviews and inventories on 20 farms purposefully chosen as practicing silvopasture. Thematic content analysis was conducted to summarize interview results and identify trends related to silvopasture practices. Three farmers in this study had been practicing silvopasture on their farms over 30 years; the rest were new to silvopasture in the past 10 years. Only three of 20 farmers interviewed in this study had experience practicing silvopasture prior to implementing it on their farms. Forest conversion to silvopasture was the primary starting point for silvopastures observed on regional farms. Orchard, open field edge, outdoor living barn, and plantation silvopastures were also documented on multiple farms. Shade and a desire to maximize use of farm woodlands were primary reasons for silvopasture utilization. This research provides evidence that silvopastures are being used to diversify regional farms. For the practice to be advanced in the region further research is needed on the topic. Silvopasture in the Northeastern United States has never been formally documented in the academic literature. Two syntheses on agroforestry and silvopasture science in North America describe silvopasture systems in all regions of the United States except the Northeast (Clason and Sharrow 2000; Garrett et al. 2004). While it is clear that some regions of the United States have a strong history with silvopasture, the occurrence of this agroforestry practice in the Northeast is relatively unknown. Recent publications have called for adoption of silvopasture by farmers in the Northeast and the topic has been highlighted during regional workshops and conferences over the last 5 years (Carroll 2011; Chedzoy and Smallidge 2011a, b). A stumbling block in the adoption of silvopasture systems in the Northeastern United States may be that there are few publicly known examples of silvopasture in the region. A 2011 publication on silvopasture in the Northeast describes the benefits and general components of silvopasture systems, but few specific examples are provided (Chedzoy and Smallidge 2011b). It is risky for a farmer to adopt a new system without an understanding of its benefits and tradeoffs in the form of established regional examples. 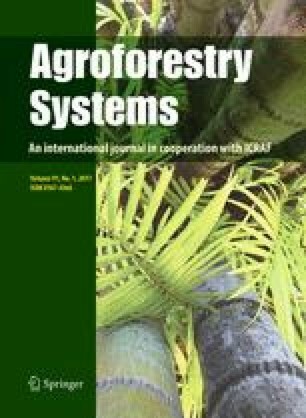 In other areas of the world the adoption of agroforestry practices has been slow due to farmer bias against trees (Neumann et al. 2007) and limited knowledge of landowners on agroforestry practices (Barbieri and Valdivia 2010). Semi-structured interviews with farmers in Colombia indicate that the primary barriers to silvopasture adoption were high establishment costs and lack of knowledge and resources available to farmers about the practice (Calle 2008). In Argentina, researchers using semi-structured interviews found that 84 % of farmers practicing silvopasture would increase the amount of land they have in silvopasture if given the opportunity (Frey et al. 2012). Agroforestry research in the United States provides insight into attitudes toward unconventional farming and forest management practices. In Missouri, for instance, many farm landowners had little knowledge of agroforestry practices yet they had interest but little knowledge in how to practice agroforestry, including silvopasture (Arbuckle et al. 2009). Another study found that family farmers in Missouri had little understanding of agroforestry practices (Barbieri and Valdivia 2010). A survey of woodland owners and farmers in Pennsylvania found the barriers to agroforestry adoption to be a lack of ability to experiment, expenses of additional management, and unknown markets for products (Strong and Jacobson 2005). Four of the top five ways farmers prefer to learn about new practices are demonstration, farm visits, field days, and discussions (Franz et al. 2010). The path to ensure the sustainable management of regional silvopasture systems starts by providing land managers with documented experiences of others to learn from and consider. Therefore, our objective was to gather baseline data to describe silvopasture practices and perspectives in the Northeastern United States. These data act as a reference point for future scientific inquiry and advancement of silvopasture. To accomplish this, we investigated the structure, management of, and reasons for use of silvopastures in New York state and New England through a series of interviews and inventories on farms practicing silvopasture. Twenty-two semi-structured interviews were conducted by phone and on-farm with silvopasture practitioners to document the details of, and reasons for the current use of silvopasture within New York state and New England. Interview questions were reviewed by multiple researchers at the University of New Hampshire and Cornell Cooperative Extension for clarity and comprehensiveness. These questions were then pilot-tested for clarity with three silvopasture practitioners prior to implementation. Phone interview questions were consistent with on-farm interviews but included an additional question asking the practitioner to describe the tree and understory species compositions of their silvopastures. In addition, we conducted quantitative inventories of silvopasture systems on selected farms. Interviews and inventories occurred in 2014. A snowball sampling technique was used to identify and purposefully sample farms practicing silvopasture. Snowball sampling allows for the identification of practitioners from other practitioners and people in the broader field (Patton 2002). Professionals in the field of silvopasture, cooperative extension agents, and professional farming and forestry organizations were used to locate self-identifying practitioners of silvopasture. Additionally, attendees of the 2011 and 2014 Northeast Silvopasture Conferences who identified as farmers were solicited for interviews. Fifty-two farms were identified through this process as potentially practicing silvopasture. Silvopasture was defined as having intentional and sustainable management of tree crops, livestock, and forages on the same unit of land. Farms for interviews and site visits were selected by the following ranked measures: willingness to offer an interview, number of years practicing silvopasture, multiple types of silvopasture systems integrated in the same farm, and number of hectares in silvopasture. Preference for an interview was given to three farms that were practicing silvopasture in states which were under-represented via the above measures, enabling the scope of this research to encompass all states in New England and New York. Of 52 farms identified, 20 farms were selected for an interview and 15 of these interviews were conducted on-farm while the remaining five were over the telephone. Three farms were not selected for interviews or site visits due to unwilling participants and the remaining 29 farms not selected for interviews were in their first year or planning stages of silvopasture development. Two foresters were interviewed on farms where they were consulting on silvopastures, this was in addition to interviews with the farmers on those two farms. Interviews lasted between 30 and 120 min and interviewees had the opportunity to answer and expand on many questions regarding their perspectives toward silvopasture, farm demographics, and the management of on-farm silvopastures. To ensure consistency, the primary author conducted all interviews. With the permission of the interviewee, interviews were tape-recorded and detailed notes were taken. Upon completion, recorded interviews were transcribed and reviewed by multiple researchers (investigator triangulation) to account for interpretation bias (Denzin 1978; Patton 2002). Thematic content analysis was conducted to summarize interview results and identify trends related to silvopasture practices (Patton 2002). Interview results were coded into the following broad categories: demographics, reasons for silvopasture use, silvopasture management (trees, livestock, and forages), and challenges of silvopasture use. Additional coding of results were completed within each main category to quantify similar responses. In addition to interviews, an inventory was conducted in silvopastures on each farm visited to determine overstory conditions and forage species composition. Twenty-three unique silvopastures at various stages of establishment were inventoried on 15 farms visited. The sampling design was a nested plot design using variable radius sampling for overstory and fixed area plots for understory plants. Sampling intensity varied between (but not within) silvopastures due to time constraints and overstory conditions. Silvopastures with low variability in tree spacing and recently established silvopastures were sampled less intensively than silvopastures which had been established for multiple years and had high variability in tree spacing. Data recorded in the overstory sample included tree species, diameter at 1.37 m off the ground, and product height. Understory sampling consisted of a percent cover of dominant forage species present, and a tally of non-forage plant species present. Qualitative notes were taken on tree vigor, tree root exposure, and bare soil exposure. Qualitative notes were also taken regarding pasture conditions and management on farms visited. Inventory data of trees, stand relative density, and forages were summarized and analyzed using Microsoft Excel and NED-2, a forest inventory and analysis program developed and available from the US Forest Service (Twery et al. 2005). Inventory data were compiled to include a summary of overstory tree stocking, health, financial value, understory forage species composition, existent non-forage plants, and photosynthetically active radiation. Inventory data and interview transcriptions were used to categorize regional silvopastures into the following groups: uniform spacing with forest origin, patch systems with forest origin, variable tree density systems with forest origin, open field edge silvopastures, plantation silvopastures, orchard silvopastures, outdoor living barns, and a silvopasture maple (Acer spp.) sugarbush. Systems that farmers perceived as silvopasture but were missing intentional management of tree crops, livestock, and forages were categorized as wooded livestock paddocks instead of silvopasture. Wooded livestock paddocks were found on some farms even though the sampling design purposefully sought out silvopasture practitioners. The exception to this was outdoor living barns which were considered silvopastures, but may have been missing the forage component, but had direct management of tree health through active livestock rotations. Areas where livestock were kept for multiple months without rotation were also classified as wooded livestock paddocks instead of silvopasture. Ten of 20 farms had at least one full time farmer with no off-farm employment and the remaining 10 had farmers with off-farm jobs in addition to their farm business. Off-farm jobs were diverse and included professionals in the medical field, law, forestry, and agricultural extension. Farmer experience was also diverse. Farmers had been the principal operator of a farm for an average of 13 years (standard deviation = 11 years) with a maximum of 42 years, and a minimum of 2 years. Tenure on their current farm, regardless of being a principal operator, averaged 14 years (standard deviation = 13 years) with a maximum of 44 years, and a minimum of 2 years. Farmers interviewed included both owner/operators and hired workers. Primary farm products were diverse between and within farms, although a primary farm product on 16 of 20 farms was some type of livestock for meat. Two farms had primary farm products of dairy cattle and the other two farms’ primary products were tree crops, including a tree nursery. Timber sales were cited as additional primary farm product on six of the farms. The size of farms practicing silvopasture varied in both land holdings (12–486 ha), percent of land in silvopasture (1–32 %), and number of livestock. Only three of 20 farmers interviewed in this study had experience practicing silvopasture prior to implementing it on their farms. All of these three farmers’ experiences with silvopasture prior to implementing it occurred in Europe or Central America. Four additional farmers claimed to have some knowledge of silvopasture prior to implementing it on their farm. The remaining 14 farmers had no, or extremely limited, prior knowledge and experience with silvopasture before implementing it on their farms. Three farmers had been practicing silvopasture on their farms over 30 years in the region and the rest were new to silvopasture in the past 10 years. The longest silvopasture documented had been in production for 42 years (in this case a forest was converted to silvopasture and trees were over 42 years old), although the median age of land managed as silvopasture was 4 years. Silvopasture was a fairly new concept to most farmers, becoming familiar with the practice over the last decade. However, seven farms had been practicing silvopasture prior to finding out it was an agroforestry practice. For example, one farmer who had been utilizing silvopastures for 30 years had first heard the term when an extension professional in his region suggested him to be a part of this study. A misconception that any integration of livestock in a wooded area would be silvopasture was held by four farmers in this study. Three farms were continuously pasturing pigs in woodlands. One farm was continuously grazing dairy cattle and horses in wooded areas. Two of the four farms utilizing wooded livestock paddocks also had well managed silvopastures being grazed by other species. Additionally, a misconception was found to exist among practitioners in the region that any use of livestock to actively eliminate or manage woody vegetation could be called silvopasture. Farmers were utilizing silvopasture for a variety of reasons (Table 1). Shade for livestock was the most commonly stated reason for incorporating silvopastures into farms with 16 of 20 farmers independently citing this as a reason for use. Expanding pasture acreage and diversity was also greatly cited by farmers, 14 of 20. Utilizing and incorporating woodlands into primary farming ventures was a reason for silvopasture adoption by 12 of 20 farmers. Incorporation of silvopasture into farm management systems was also diverse. Farms were primarily utilizing silvopastures during the grazing periods of late-spring, summer, and fall. All farmers used silvopastures during the hot periods of the summer. All farms, except one, utilized both silvopastures and open pastures in their grazing operations, but not necessarily in the same paddock. Some farms reserved silvopastures for certain times of the year, such as hot periods in the summer or inclement winter weather, while others kept them as a patchwork within on-farm livestock rotations. Farmers identified the early spring (mud season) as a time when livestock were excluded from silvopastures (although one farm utilized silvopastures year round). During mid-summer and times of droughts, farmers were utilizing silvopastures because they perceived that silvopastures had greater forage availability during these periods (Table 1). Fencing establishment, such as type to utilize and methods of construction, and maintenance of fencing of paddocks was stated as a challenge by 9 of 20 farmers interviewed when asked what their major challenges were when managing silvopastures (Table 1). Lack of knowledge toward silvopasture and lack of time for silvopasture management were cited as challenges by six and five farmers of 20 interviewed, respectively. Forage management and unknown forage quality was another area farmers expressed as a challenge toward managing silvopastures. One of 20 farmers interviewed was not planning to continue practicing silvopasture in the future. This farmer intended to phase out practicing silvopasture in order to create a better view through tree removal, increase options for his agricultural land, and make fencing more time efficient. However, the 19 other farmers interviewed were pleased with the practice, and 14 of these farmers intended to increase the amount of land on their farm in silvopasture. The amount of silvopastures on farms ranged from less than 1 ha to 73 ha, with a median of 5 ha per farm. Sizes of individual silvopastures on farms were typically less than 1–2 ha. Forest conversion to silvopasture was the primary starting point for silvopastures observed on regional farms (Table 2). The most common of these was a conversion to uniform tree spacing. In these systems mature hardwood, softwood, and mixedwood forests were heavily thinned from the lower canopy classes, leaving well-formed co-dominant and dominant stems as residuals. Oak, maple, and eastern white pine were the most common species favored as residuals in silvopasture converted from forests. Farmer goals for these species were primarily timber, but in the case of oak, acorns were also favored by many farmers as a livestock supplement. Residual basal area of forests converted to uniformly spaced silvopastures ranged from 6 m2 ha−1 (546 trees ha−1) to 30 m2 ha−1 (282 trees ha−1), with an average basal area of 17 m2 ha−1 (343 trees ha−1). Five silvopasture systems converted from forestland utilized patched grouping of residual trees. Patch sizes were small, <0.25 ha, and greatly variable in shape. Multiple patches of trees were interspersed within similarly sized patches of open pasture in these systems. Farmers’ reasons for choosing grouped tree retention in silvopastures included working with unequal distribution of quality trees in the pre-silvopasture forest, ease of creation, and ease of management. Tree spacing was so heterogeneous in three hardwood silvopastures that these were classified as irregular tree density due to their difference from both uniformly spaced systems and patch systems. Seven farms in this study were incorporating silvopastures into the edges of open pastures (Table 2). To benefit from forest edge encroachment into open pastures, some farmers had converted overgrown field edges into silvopastures by thinning trees. Others had converted portions of (non-encroaching) forest adjacent to open pastures to silvopastures in an effort to diversify the shade conditions of regularly used open pastures. Grazing partitioning of these edge silvopastures contained both open areas and wooded areas, as opposed to grazing the silvopasture edge separately from the open pasture area. Thinned and managed trees in the field border was also valued for aesthetic reasons by practitioners. Three types of plantation silvopastures were observed in this study. One, conifer plantations, were being utilized as outdoor living barns and will be discussed in a following paragraph. The other two types were hardwood plantations. Two farms had established black walnut (Juglans nigra) in open pastures and were utilizing the plantations as a silvopasture. Black locust was the other hardwood silvopasture plantation documented. These plantations had basal areas of 17 m2 ha−1 (734 trees ha−1) and 21 m2 ha−1 (974 trees ha−1). Trees were being grown primarily for use as fence posts, and harvested through commercial thinnings at years 15, 20, and 25. Initial establishment of trees in these systems was through seedlings, but on one farm the next cohort was being established through a coppice system. Four farms in this study were utilizing outdoor living barns (Table 2). Outdoor living barns are silvopasture systems in which tree density is maintained at an abundant level to maximize the amount of shelter that trees provide to livestock. Forages in all of these outdoor living barns documented were very sparse or non-existent. Outdoor living barns consisted of areas of dense conifers. Farmers stated the purpose of their outdoor living barns were to produce timber or fence posts, in the case of northern white cedar (Thuja occidentalis), while also providing shelter for livestock during exceptionally cold periods of the year. Farmers stated that outdoor living barns were not utilized as permanent winter paddocks nor did these areas experience livestock pressure during the spring thaw of frozen ground. One farm maintained an outdoor living barn to provide shelter and biting fly relief for livestock during the summer grazing period. Six farms in this study incorporated livestock into orchards as a form of silvopasture. Farmers stated the value of these systems were fertilization to trees, grass management, livestock nutrition, and reduction in rodent habitat. Orchards were primarily comprised of apple trees (Malus spp.) and, in some cases, with lesser components of other fruit or nut trees. Farmers were using fruit products from orchards for on-farm consumption, direct marketing to consumers, livestock feed, and scion wood. Spacing between trees in orchard silvopastures were typically uniform in pattern with space between tree crowns, but variable in terms of actual distance between trees. Primarily sheep or cattle were incorporated into orchard silvopastures by grazing in the summer months, and in the fall after excess fruit has dropped. Farmers grazing sheep in orchard systems did not express a fear of damage to fruit trees from livestock while farmers utilizing cattle stated the importance of short grazing periods to avoid tree damage in orchards. Regeneration of new fruit trees was accomplished through individual tree protection mechanisms. Farmers did not mention any food safety concerns regarding livestock and orchard integration. One farm in this study was utilizing a maple sugarbush as a silvopasture for beef cattle to keep brush down in the sugarbush and provide shade for livestock. This farmer was periodically grazing a herd of around 90 beef cattle in a 6 ha production sugarbush for over 25 years. Cattle were only introduced to the sugarbush during dry periods of the summer, such as late July and early August. The farmer stated that he intentionally installed sap lines as high as possible to avoid livestock damage. The farmer attributed low forage availability in the sugarbush to high tree density. Livestock type raised on farms in this study was diverse and ranged from 1 to 6 varieties of livestock on each farm and incorporated into silvopastures. Livestock incorporated into silvopastures included beef (12 farms) and dairy cattle (2 farms), sheep for meat and/or fiber (6 farms), meat (3 farms) and dairy goats (1 farm), chickens for meat or eggs (4 farms), turkeys (2 farms), and horses (2 farms). Pigs were used in the establishment phase of silvopastures on 4 farms. Four other farms were raising pigs in wooded areas for a month or longer without pasture rotation, these areas were not considered silvopastures due to a lack of forage and tree management. Number of livestock was diverse between farms with maximum values of 130 beef cattle, 8900 poultry, or 200 dairy goats. The minimum end of the range for livestock on farms included two dairy cattle, 30 poultry, or nine sheep. Only one of 20 farmers interviewed was not using rotational grazing techniques when managing livestock, although this farm was planning to transition to a rotational grazing system. Some farmers considered moving animals once a year as rotational grazing, while others understood rotational grazing to mean moving animals at least every few days. Rotations lengths used for cattle, sheep, goats, and horses in silvopastures ranged from less than one day to a maximum of 21 days. Rotation lengths utilized by farms for pigs ranged from two days to 365 days. Poultry were integrated into silvopastures on six farms, but four of these farms simply allowed poultry to free-range into silvopastures. The other two farms integrating poultry into silvopastures rotated them on a one to three day rotation. With the exception for pigs, farmers were using forage height and availability as a measure of when to move livestock into and out of silvopasture paddocks. All farmers pasturing pigs utilized signs of site or tree damage as indicators for when to move them. Site damage included muddy ground, visible soil erosion, and visible soil compaction. Challenges of moving pig fencing, housing, and watering systems were referenced by farmers as a primary reason for long (or no) rotations of pigs in wooded areas. The primary reason for pig incorporation into wooded areas was for the welfare of the pig from the shade of trees and as a form of vegetation management. Farmers saw the forest as a foraging area for pigs to consume roots, nuts, and insects. Where pigs were utilized in the first year of silvopasture establishment and in wooded paddock situations, between 32 and 100 % of inventoried trees had some form of basal damage or root exposure due to livestock. Three farms had damage on 100 % of the trees in pastures where pigs were incorporated. Additionally, bare mineral soil exposure ranged from 20 to 100 % within areas actively pastured with pigs. When asked about animal health concerns in silvopastures compared with open pastures, nine of 20 farmers explicitly stated that they felt animal health was improved in silvopastures, primarily because of shelter and a diversified diet. Farmers expressed the following concerns regarding animal health in silvopastures: predators (3 farms), falling tree branches (2 farms), hunters (2 farms), parasites (2 farms), toxic plants (2 farms), physical injuries to livestock (1 farm), and limited visibility and access to livestock (1 farm). Only two farmers had livestock injury actually occur in treed pastures; one farmer stated hoof injury to pigs and the other farmer stated two cows’ tails being caught and torn-off by woody vegetation. Orchardgrass (Dactylis glomerata), bentgrasses (Agrostis spp. ), bluegrasses (Poa spp. ), red clover (Trifolium pretense), white clover (Trifolium repens), timothy (Phleum pretense), and fescues (Festuca spp.) were commonly observed in silvopastures (Table 3). In newly established silvopastures converted from forests bentgrasses and poverty oatgrass (Danthonia spicata) were common volunteer grasses inventoried. Eleven of 20 farms interviewed were actively seeding forages into silvopastures. Broadcast seeding in the spring and fall and out-feeding of hay in silvopastures were being used to establish forages. Across the region, forage species observed in silvopastures were similar to those commonly found in open pastures on similar quality soils. Three farms were specifically managing woody browse as a component of forage in their silvopastures, but these farms did not provide specifics in terms of preferred woody browse species. Twelve of 20 farmers considered woody invasive alien shrubs as undesirable plants in their silvopastures. Eight of these 12 farms specifically named multiflora rose (Rosa multiflora) as challenging weed in their silvopastures. Other undesirable plants, native and introduced, that were mentioned by more than one farm are listed in Table 4. Farmers were primarily managing trees in silvopastures for sawtimber, firewood, and nuts/fruit (Table 5). Other management goals for trees in silvopastures are listed in Table 5. Trees species/groups stated as favorable by multiple silvopasture practitioners included oak, maple, fruit trees, eastern white pine, and others (Table 5). Ten of 20 farms in this study did not receive direct financial benefit from the trees in their pastures. Four farms had only received financial benefits from trees in their silvopastures when timber was sold as part of the initial timber harvest converting a forest to silvopasture. Five farms received direct financial income from trees in their silvopastures; these were a commercial tree nursery, farm with black locust thinned for fence posts, fruit from orchards, and maple sap. Six farms were actively regenerating trees in their silvopastures, the remaining 14 farms stated that they were not actively regenerating trees at that time. Individual tree fencing was being utilized by six farms to regenerate trees in silvopastures, one farm was also using a coppice system for black locust, and another farm was allowing hardwood sprouts to regenerate in the piles of slash left over from the initial conversion of forest to silvopasture. Twelve of 20 farms had worked directly with a forester when developing silvopastures, and eight of those 12 found the forester to be supportive of silvopasture. One farmer actively avoided working with a forester in silvopastures, stating that foresters did not know much about silvopasture. Three farmers had switched the foresters they were working with and hired new foresters who were more open to the practice of silvopasture. The two foresters interviewed in this study stated their involvement with silvopasture was due to demand for the practice from clients. Three farmers expressed lack of support from agricultural extension agencies for silvopasture as a major challenge they faced in adopting the practice (Table 1). Farmers were especially frustrated when extension personnel confused their silvopastures with poorly managed wooded livestock paddocks. However, the converse confusion also occurred by farmers practicing continuous pasturing of woodlands with pigs and calling it silvopasture. Areas of research desired by farmers on silvopasture were diverse (Table 6). Eight farmers requested visuals and commercially viable case studies of regional silvopastures. When asked what resources they would utilize to learn about silvopasture, farmers varied greatly in their responses. Farm tours were cited as important educational opportunities by 12 farmers, but timing of these tours was cited as a challenge. Farmers were split between desiring online resources such as webinars and web pages while others preferred printed material. Extension personnel, conferences, and other farmers were cited as educational resources farmers would utilize in obtaining information about silvopastures. Silvopasture systems utilized in New York state and New England were diverse in terms of structure and reasons for use. Tree density and spacing differed between silvopastures, and in some cases within silvopastures. Coupled with this, farmers’ goals for the trees in their silvopastures were multiple and on-farm use was often one component. Forages in these systems were also variable and seemed to be highly dependent on multiple site conditions. Despite this heterogeneity, four key issues emerged that warrant follow-up: the need to distinguish between silvopasture and livestock in wooded paddocks, the complexity of integrating livestock and tree management in silvopastures, the unique challenges of managing pigs in silvopasture, and the opportunity and demand for silvopasture outreach in this region. The most pressing concern is the confusion around what is and is not silvopasture. Specifically, confusion existed between silvopasture and any incorporation of livestock into areas with trees or woody vegetation, regardless of tree health or livestock management. Of significant concern were some farmers mislabeling degraded wooded livestock paddocks as silvopasture. This confusion poses a severe risk to the successful adoption of the practice in the region as it furthers the confusion between farmers, extension professionals, and foresters as to what silvopasture really is. Worse yet was the degradation happening to woodlands and not realized by farmers who might have believed they were doing the “right” thing. A clear and consistent message toward what makes successful silvopastures coupled with best management practices needs to be developed for silvopasture in the Northeastern United States. Little knowledge of landowners about agroforestry practices is not unique to the Northeastern United States (Barbieri and Valdivia 2010), and farmer education has been shown to lead to successful agroforestry adoption (Frey et al. 2007). While farmers interviewed in this study favored trees, many of them were unaware of how to manage trees. Farmers were challenged by the complexity of integrating livestock and tree management in silvopastures. Farmers typically prioritized the care they give to each silvopasture and woodland component based on their primary economic crop. For example, farmers whose primary farm income was cattle-based would respond to questions about silvopasture management in terms of cattle production and wellbeing and not mention tree crops or health. The reverse was true when speaking to farmers about silvopasture orchards where the primary economic crop was fruit. In the cases of wooded livestock paddocks, this difference could be extreme; for example, one farm with wooded livestock paddocks received $20,000 per year net income from pork, but utilized woodland trees only for heating a small home with firewood. This farm recognized the damage being done to forest soils by pasturing pigs on long rotations, but the short-term (annual) economics did not dictate caring for their trees. An opportunity exists for agricultural extension professionals and foresters to aid farmers in managing and optimizing these complex systems. Resources need to be developed to assist farmers in managing silvopastures. Best management practices regarding livestock, trees, and forages coupled with case studies and silvopasture demonstration areas would go a long way in ensuring that farmers are integrating functional silvopastures into the regional landscape. Additionally, identifying the benefits and tradeoffs of silvopasture to livestock, the environment, and farming economy is an important regional need. Managing pigs in a silvopasture system is uniquely challenging due to their rooting and destructive nature. The fundamental problem with pasturing of pigs was that the movement of pigs out of a paddock was reactionary and driven by indicators of site damage, such as heavy soil compaction or damage to trees, and/or persistent breakouts by pigs to find new areas. Movement of any livestock to a new paddock should be proactive and before damage occurs. Ironically, on farms which pastured both pigs and other livestock, the other livestock were moved based on signs of reduced forage availability, such as forage height, while pigs were still moved in reaction to site degradation. This was also the case on farms where pigs were the primary source of income; cattle were moved daily yet pigs were moved monthly. This difference in species management may have been the result of farmers being required to bring feed to pigs regardless of site conditions, whereas feed was an extra cost to farmers when their grazing animals were on pastures without available forage. Additionally, farmers were pasturing pigs by trial and error, but were aware of recommended management practices for other livestock species. In Europe the use of pigs in areas with trees has been going on for centuries, but it is often only in the fall to allow pigs to glean fallen nuts or fruit (Rigueiro-Rodriguez et al. 2009). Lessons from Europe would suggest that the incorporation of pigs into forestland necessitates active management. According to the German law, pigs are banned from forests unless natural regeneration of beech and oak trees is guaranteed (Rigueiro-Rodriguez et al. 2009). Pigs in European systems are primarily consuming mast, whereas what was witnessed in this research were pigs consuming actual components of trees, primarily roots and lower bark. The grazing of pigs to forage fruit and nuts is much less destructive to tree health than allowing pigs to browse tree roots. Grazing implies forage availability and management, therefore the systems documented here would be best termed rooting or neglect. There was a desire among farmers to be doing the right thing, despite the destructive nature of pasturing pigs documented here. The challenge was those farmers did not have the resources to determine what the right thing was: “Was I really doing silvopasture or was I just running pigs in the woods?” Timing was a major factor in this degradation and a simple recommendation may be for farmers to set up multiple paddocks for pigs prior to their introduction into silvopastures. Development and maintenance of a sod layer in silvopastures may also help to buffer soil degradation and rooting from pigs. Twelve farmers interviewed in this study had been utilizing silvopastures for less than 5 years, suggesting that silvopasture is a budding regional practice. Agricultural extension professionals and researchers are in a unique position to influence the development of silvopasture practices at the beginning stages of their adoption in the region. Farmers were well aware of public education and extension efforts toward invasive alien forest pests, suggesting that similar efforts toward silvopasture management would reach the right people. One challenge faced by farmers in this study was an inconsistent message being put out by extension professionals within and between states. For example, three farms were actively working with extension professionals in development of silvopastures, while other farms were very frustrated with the lack of support, and in some cases clear mistrust for silvopasture by extension professionals. Additionally, four farms in this study practicing silvopasture were actually owned and operated by agricultural extension professionals in differing states. In a region as small as the Northeastern United States, it is important that messages toward agricultural practices are consistent between states as regional farms commonly cross-pollinate information. This study was limited by a small sample size, time constraints for silvopasture inventories, and an intentionally biased participant identification. A limitation to use of purposeful sampling is that it intentionally favors sampling of a single group. This study did not seek out non-adopters of silvopasture who were familiar with the practice. Follow-up studies should consider addressing this group to identify concerns regarding silvopasture that inhibited adoption. A regional assessment should be conducted in the Northeastern United States to address the extent and full diversity of silvopasture and differentiate it from livestock simply being kept in wooded paddocks. This study was also limited in being able to fully assess how well silvopastures were being managed, as no management recommendations exist for silvopastures in the region. Examples exist of decades old, well managed silvopastures in New York state and New England, although the majority of silvopasture identified in this study were in the first few years of establishment. Farmers practicing silvopasture found it to be a functional and desirable component of their farm landscape. Confusion between silvopasture and degraded wooded livestock paddocks exists in the region and poses a significant threat to the success of silvopasture. Specifically, the use of pigs in wooded areas needs to be addressed as farmers in the region are causing severe damage to woodlands through poorly managed pasturing of pigs. Regardless of livestock species or silvopasture type, this study provides evidence that silvopastures are being used to diversify regional farms. If best management practices regarding silvopasture are developed, it is likely that they will reach and be considered by farmers. Farmers’ knowledge about silvopastures was homegrown or based on systems from other parts of the world. For the practice to be advanced in the region, further research is needed on the topic. Farmers in this study have identified numerous areas of applied research which would help them improve their silvopasture management. Research into the integration of farm woodland into agricultural ventures, benefits of shade to livestock, potential for increased forage availability during mid-summer and droughts, and diversified livestock diets would serve the region well. Additionally, outreach should occur on fencing strategies, vegetation management, and forage establishment in silvopasture systems. We would like to thank all of the farmers who contributed to this research by sharing their experiences and pastures with us. Thanks is due to Richard Smith, Heidi Asbjornsen, and Ted Howard at the University of New Hampshire for their guidance and assistance with this study. We would also like to thank Brett Chedzoy, Peter Smallidge, and Jeff Jourdain for their contributions in the development of this project. This project was supported by the Northeastern States Research Cooperative through funding made available by the USDA Forest Service. The conclusions and opinions in this paper are those of the authors and not of the NSRC, the Forest Service, or the USDA.